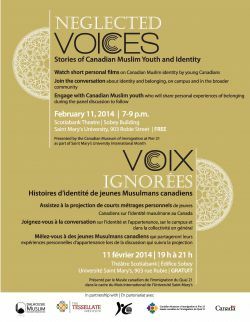 Watch short personal films on Canadian Muslim identity by young Canadians. Join the conversation about identity and belonging, on campus and in the broader community. Engage with Canadian Muslim youth who will share their personal experiences of belonging during the panel discussion following the screening. Admission is free and all are welcome. This event is presented by the Canadian Museum of Immigration at Pier 21 in partnership with the Dalhousie Muslim Student Association, Saint Mary’s University International Centre and the Tessellate Institute as part of Saint Mary’s University’s International Month.